Are you milling over an unanswered question? We got you. What are CGC Gorilla Mill’s office hours? Customer service is available Monday through Friday from 7:00am – 4:30pm CST. Where is CGC Gorilla Mill located? We are located at our Northeastern plant just outside of Milwaukee, Wisconsin. How can I purchase Gorilla Mill products as an end user? End users are able to purchase from any of our distributors. If you need help finding a distributor in your area, please check out our distributor page. You can also call our main office at 262-549-5940 or toll free at 866-888-9600. How can I become set up as a Gorilla Mill distributor? If you are interested in becoming a distributor, please e-mail your request along with company name and address to orders@cgctool.com. Does CGC have an online storefront? You can now find any of our standard Gorilla Mill products on Amazon. Where are Gorilla Mill products manufactured? 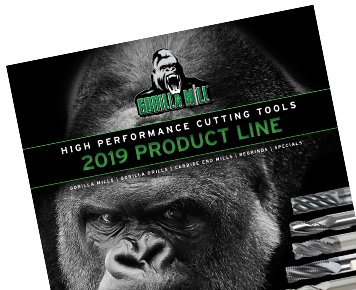 Gorilla Mill® end mills and cutting tools and Gorilla Drills® are manufactured and sharpened at our North American plant outside of Milwaukee, Wisconsin. Does CGC Gorilla Mill ship internationally? Currently we ship internationally and are always looking to expand. How can I get technical assistance? For technical assistance, please call our main office at 262-549-5940 or toll free at 866-888-9600. How do I get speeds and feeds? For help calculating speeds and feeds please see our “Speeds and Feeds” calculator. Do you offer reconditioning services? CGC Gorilla Mill offers re-sharpening, regrinding, reconditioning and recoating services. Please call 262-549-5940 and ask for our regrind department for more information. How and where do I send a regrind purchase order? You are able to send the parts to our building at W226 N735 Eastmound Drive in Waukesha, WI 53186 using your packaging or you are able to request one of our Gorilla Crates. Please also put ATTN: REGRINDS somewhere on the package. Where do I send a new purchase order? If you are a distributor buying for your end user please send emails to orders@cgctool.com or FAX 262-549-3904. End users looking to buy can find the closest distributor by going to our Distributor page. What is shipping lead time? We are able to get most orders out same day. Order cut-off time is 4:00pm Central Time. If you think you might miss the cut-off time and need something to go out same day, give us a call at 262-549-5940 and we will do our best to meet your needs. Where do I send quote requests/special requests? Please send all requests to orders@cgctool.com with specifications, prints and any quantity breaks. How can I get catalogs from CGC? Please send a request for catalogs to orders@cgctool.com with the quantity you are looking for and shipping information. What is CGC Gorilla Mill’s return policy? How do I get an RMA? CGC return policy is that the request must not exceed 90 days from purchase. If requesting an RMA please send an email to orders@cgctool.com with the PO number, part numbers, quantity, reason for return, and if the tools have been used or not. How do I get a Guaranteed Test Order (GTO) from Gorilla Mill? Distributors: Please contact your local sales representative or call 262-549-5940 for further assistance. End User: Please contact a distributor with your request.